Ashwagandha, otherwise known as Withania somnifera, Indian Ginseng or winter cherry, is an herb in the nightshade family. The plant can grow up to five feet in height, with yellow flowers and fruit smaller than grapes. Ashwagandha has been prized for its medicinal benefits for more than 5,000 years in India. In Africa, it’s used as a traditional remedy to treat a variety of illnesses. (X) Research suggests it could help treat ailments like asthma, fibromyalgia, anxiety, and stress. Withania somnifera benefits your health in numerous ways, but is most well-known as a stress reliever. Since stress and anxiety affect over a quarter of the U.S. population, herbal supplements are growing in popularity as those affected seek natural alternatives to prescription anxiety medication. Ashwagandha may also improve your focus and concentration. 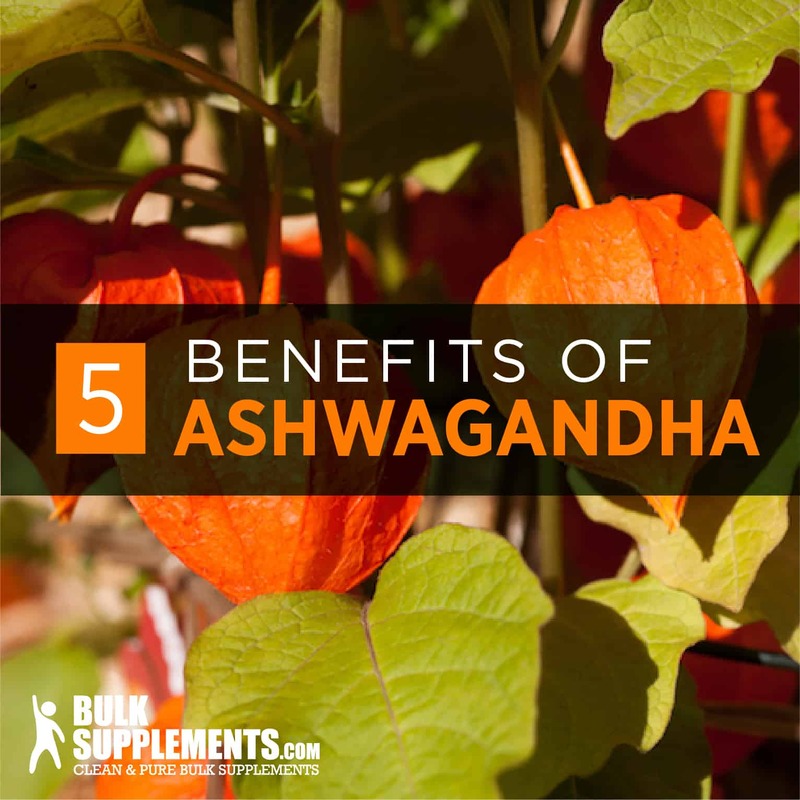 Many studies indicate that ashwagandha benefits cognitive function, with improvements noted in reaction times, mental mathematic abilities, and in sensorimotor roles. 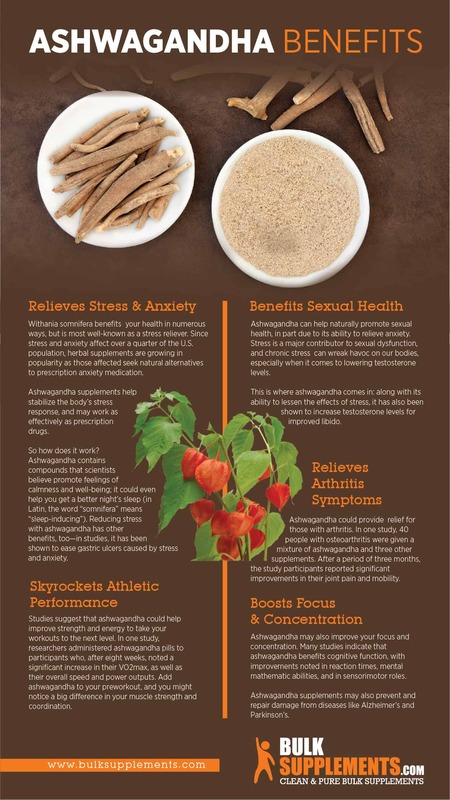 Ashwagandha can help naturally promote sexual health, in part due to its ability to relieve anxiety. Stress is a major contributor to sexual dysfunction, and chronic stress can wreak havoc on our bodies, especially when it comes to lowering testosterone levels. Because ashwagandha has calming qualities, it’s best to take it before bedtime. Ashwagandha powder is the typical form of this supplement and can be mixed into the beverage of your choice. If you’re not a powder person, it’s also available in a tablet form. These don’t need to be taken with food, and you can take them at any point during the day. Aswagandha extract is another option. In its powdered form, it can be mixed into your drink of choice, and has the added benefit of an extended shelf life. The herb can also be made into a paste and then applied topically to the skin to treat ulcers and boils. Ashwagandha side effects are minimal when used short-term. Long-term usage of this supplement may cause gastrointestinal distress. If you are nursing, pregnant, or planning to become pregnant, do not take this supplement. Side effects can include a possible decrease in blood sugar levels, so if you are diabetic, talk to your doctor before taking this supplement. Ashwagandha may lower blood pressure; if you are taking medicine to regulate your blood pressure or have low blood pressure, speak with your doctor before using ashwagandha. If you are prone to or currently have any ulcers, do not take this supplement. Refrain from using ashwagandha at least two weeks before a scheduled surgery. Ashwagandha has been used for thousands of years for medicinal purposes. This potent little plant provides stress relief, boosts focus, improves sexual function, and benefits overall wellness. It’s a nutritional powerhouse 5,000 years in the making.